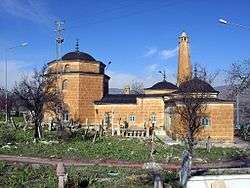 Tillo or Aydınlar is a district of Siirt Province of Turkey. Name of the district was Aydınlar until 7 November 2013. Syriac language Tillo means holy spirits, and appropriately it is the home of many tombs. In the 1514 reign of Yavuz Sultan Selim, Tillo was taken by the Ottoman Empire by the Çaldıran Victory. After Tillo became a district of Siirt, it was named Aydınlar. It has an ancient cultural and social history. Lots of visitors come to visit the mausoleums of holy persons such İsmail Fakirullah Hz.,İbrahim Hakkı Hz., Şeyh Hamza El Kebir Hz., Şeyh Mücahit Hz., Gavsul Memduh Hz., Zemzemul Hassa Hz. (Kadın Evliya). Name of the district is changed on 30-October-2013 by Turkish Parliament after change of constitutional law, which forbids languages to be used for city names other than Turkish, on 30-September-2013.